MISSION STATEMENT The Cotuit-Santuit Civic Association is a non-profit organization whose purpose is to furnish Cotuit residents with a forum for the discussion of matters of civic concern and to provide a means to address those concerns in ways that will serve the best interests of the Village. The Association seeks to identify the needs and concerns of the Village, to inform residents about matters that affect them, to present the needs and concerns to the Town government, and to attempt to spur action to resolve those matters. The Association also sponsors activities and programs of general interest, in an effort to promote a vital sense of community in the Village of Cotuit. ACTIVITIES AND PROGRAMS The Association conducts meetings open to the public periodically throughout the year at which matters of general interest are discussed, often with participation of Town representatives. 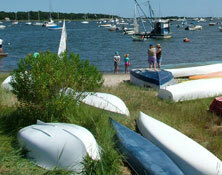 The Association also organizes and presents the annual Fourth of July Parade and the Christmas in Cotuit events. The Association also prepares and distributes a newsletter, Cotuit Currents, which includes information concerning events of other non-profit organizations in the Village. MEMBERSHIP Membership in the Association is open to all interested parties. Dues and contributions received help to defray the expenses of the Association, including the costs of the Fourth of July Parade, the Christmas in Cotuit events and various public improvement initiatives. You can become a member by downloading the form on this site at “Become a Member,” clipping the membership form from the Cotuit Currents newsletter, or sending the information called for on those forms, together with the $25 annual dues, to P.O. Box 121, Cotuit, MA 02635.